For as long as I can remember, Essie has been my go-to nail polish brand. I can even remember all the way back to around fourth grade, when I would receive a new bottle in my Christmas stocking or my Easter basket and get so excited. I've never been a fan of any other brand except for Essie. Between the vivid colors, the sleek, simple packaging, and the long-lasting formula, I've been hooked on Essie for about five years now. Thus, I've had a long time to develop my collection and discover some of my favorite shades. 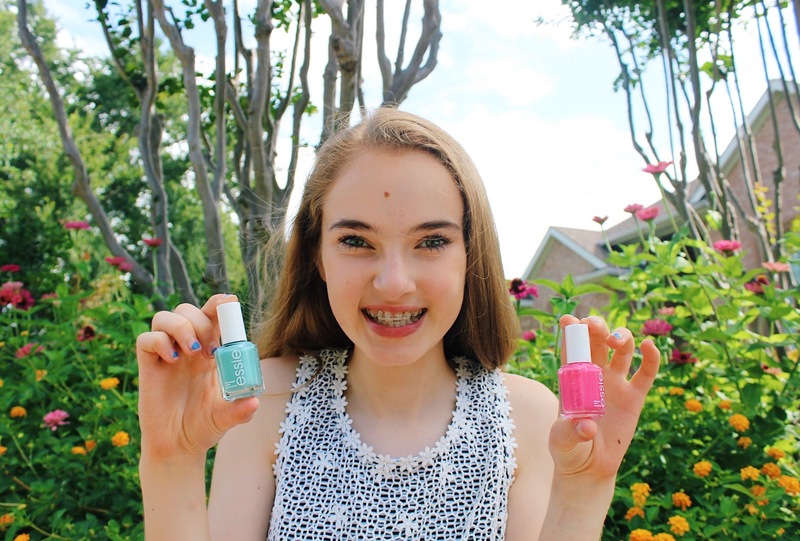 Today, I'm sharing a bunch of my favorite nail polishes with y'all as I show you the five nail polish shades every girl must own! Also, this post is not sponsored by Essie at all (a girl can dream, though!) I know it may seem like it's sponsored, but I promise my love for the brand is 100% authentic - just felt like I should put that disclaimer out there. Light Pink // Almost everyone raves about Essie's Fiji, and while I've personally never tried it, I love Hi Maintenance! It's such a pretty, girly color, and looks great against all skin tones at any time of year! While it is a little light, it's perfect for events where you want a more subtle tint to your nails. Hot Pink // Essie's Fiesta is the only nail polish bottle I've ever completely used up. It's easily my favorite polish of all time! Hot pink nail polish looks so good no matter what, and is such a happy color. I was so sad when I ran out of this color, so I'm definitely purchasing another bottle soon. Turquoise // I can't tell you how many turquoise nail polishes I've gone through over the years. My favorites are Where's My Chauffeur, Turquoise & Caicos, and Fashion Playground. A light turquoise polish is the perfect spring hue, and brighter turquoises are great for summer! Deep Blue // I recently used Pret-A-Surfer for the first time, and it's already become one of my favorite shades! It's a little dark for my hands, but the crisp, cool blue looks perfect on my toes for any time of year! It really stands out against white sandals. Brown // While a brown nail polish does sound a little weird, it's the perfect shade for fall! I received Mochachino a couple years ago as a gift, and it's practically the only nail polish I wear during the fall and winter months. It goes so well with dark, neutral outfits! Shop all the nail polishes featured in this post by scrolling through the widget below! I'm always looking for more nail polishes to try - let me know your favorite by leaving a comment below!